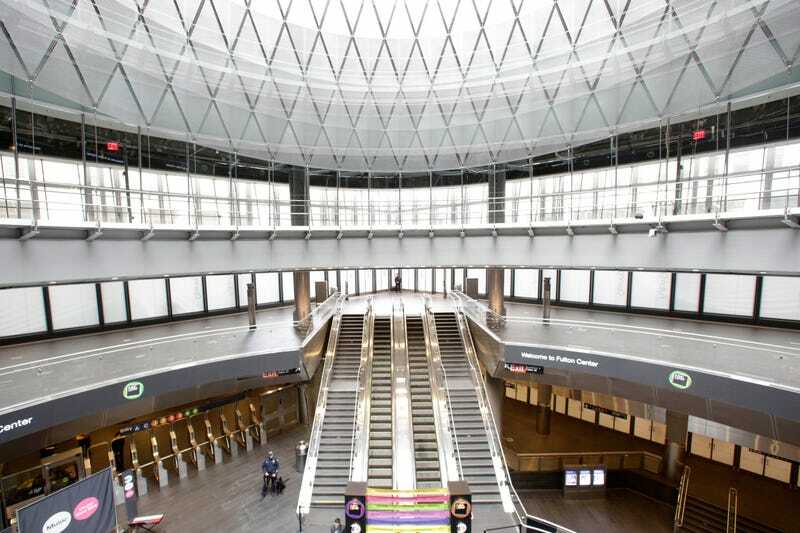 It's taken many years and over a billion dollars to complete Fulton Center, a transit mega-hub that replaces the subway station destroyed on September 11. Today, the light-filled station finally opened to the public—but it almost didn't happen at all. Early this morning, the MTA opened up Fulton Center to the first trickle of some 300,000 commuters who will use it on a daily basis. Greeting them was a flashy reflective facade and, inside, a soaring atrium culminating in something called a Sky Reflector Net—an installation designed by Arup and Grimshaw that uses over 1,000 aluminum panels to reflect sunlight down into the station. One MTA official called it "jaw-dropping." But make no mistake: The path that led to Fulton Center has been paved with extraordinary challenges. It's rare that a construction project in New York goes smoothly, but the Fulton Center has been particularly fraught. Planned since 2002, the project managed to survive through the worst of the 2008 financial crisis, surviving cost cuts and funding delays at every turn. Even the MTA, at one point, declared it would not be able to build the center as designed. The Federal government originally denied the MTA's request for more cash, saying "absolutely not." The New York Post, being the New York Post, called it a "$900 million boondoggle." The final bill for the station is double the MTA's original estimate. But it's not just a miracle that Fulton Center managed to get funded—it's a miracle it managed to get designed at all. First of all, eleven different trains come through this one complex, or nine unique lines. The New York Times explains that when New York's subways were privately owned, three competing companies came through Fulton. So the transit designers had to reconcile an incredibly complex, century-old rat's nest of infrastructure that was originally designed to compete with other pieces of the network. To install escalators that would move passengers between the Fulton Center and the Dey Street passageway, the Corbin Building had to be structurally underpinned. On such a tight lot, as little as 20 feet wide, mechanical excavators could not be used. The pits for the new foundation work were dug by hand — with picks, shovels and buckets. Yep, the project required shovels and buckets. So if you're passing through Fulton Center's glassy, light-filled atrium or the brushed aluminum corridors today, take a second to consider that the most complicated and advanced subway station built in New York City involved construction techniques that are as old as the city itself.